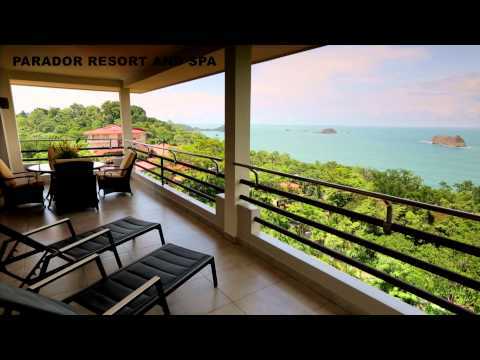 The #1 Ranked Hotel in Popular Manuel Antonio. The Premium rooms offer an incredible 180 degree views of the ocean and the jungle. These rooms are ideal for couples looking for peace and quiet while taking in the endless views of the landscapes. The panoramic elevator affords Guests an incredible view of the mountains, Ocean and the resort, while making their way to their rooms. The Vista Suites at Parador Resort offer elegant design and contemporary amenities. The Suites include a spacious living area, one King-sized bed, private balcony with Jacuzzi, exclusive local artwork, open-design bathroom with double sinks, separate tub and shower. The Vista Suites are located at the property`s apex in Las Suites, the resort`s self-contained and newest complex which offers outstanding views as well as a private infinity pool and Jacuzzi. Important Notice: Minimum age allowed on this private pool is 15 years old. The resort is located on the Punta Quepos promontory in Costa Rica, surrounded by 12 acres of wildlife-rich tropical rainforest with panoramic views of the Pacific Ocean and Manuel Antonio. The entire Parador Resort experience is limitless. Here you can experience exotic wildlife, tropical gardens, boundless pools, expansive views, excellent service, delicious meals, relaxing massages, romantic settings, exciting tours, and much more! One of the most popular destinations in Costa Rica, the Manuel Antonio National Park, awaits with pristine beaches, an unspoiled rain forest full of exotic wildlife and one of the country`s most emblematic hotels. The Parador Resort and Spa. The hotel has been awarded five out of five leaves of the Certificate of Sustainable Tourism by the Costa Rica Tourism Board, certifying this hotel is ecologically friendly and responsible! At Parador Resort and Spa you can lounge for hours at the infinity swimming pool, gazing at the incredible views while sipping on your favorite cocktail, relaxing and reading your favorite book at the adult pool, or simply take advantage of the different recreation activities. Parador`s 129 accommodations are divided among four separate buildings. All accommodations offer ocean, jungle or garden views and all of the amenities today`s modern traveler has come to expect. Four full-service restaurants available on-site serving international and local fare made from the freshest ingredients, as well as several lounges and bars, great for happy hour or after-dinner socializing. Live piano music complements fine dining at La Galera, an elegant ocean-view restaurant overlooking the hotel`s gardens and beautiful pool area. The restaurant offers a diverse menu and daily specials that spotlight the tropical flavors of local cuisine alongside Mediterranean-inspired dishes. Open for breakfast, lunch and dinner. An extensive breakfast buffet is included in the room rates. If you crave a relaxed ambiance and casual evening dining, El Quijote fits the bill. A varied international la carte menu offers both kids and grownups plenty of palate-pleasing options prepared by the top chefs with fresh ingredients. Located at the property`s highest point in the Ocean Vista building, the casual La Fragata Ocean View Restaurant serves up a selection of fresh fare and tasty cocktails with a side of breathtaking views and cool ocean breezes. Pool bar service is available all day. Stunning sunsets make this a great choice for early evening cocktails. La Reina is an elegant medieval-style private dining room complete with a personal server. Flickering candles provide a dreamy ambiance for a romantic rendezvous or an intimate gathering. Enjoy a romantic dinner in a very private wine cellar. White glove service comes with a specialty menu you can create from any of the offerings of the on-site restaurants. Relax with a before or after dinner cocktail in this cozy European-style piano lounge located at La Galera Restaurant [outdoor seating is also available on the surrounding terrace.] This is a great meeting place for old and new friends to share their days adventures. Hungry and thirsty but dont want to leave the cool waters of the beautiful main pool? They`ve got you covered! A light lunch menu or sushi served on the terrace will meet your need for food while the swim-up bar will take care of your thirst without your ever having to step on dry land. Indulge in a tropical cocktail or a chilled local beer while gazing at the spectacular ocean view. Enjoy a game of pool or an after-dinner drink at this comfortable gathering place located on the main floor of the hotels main building. Cushioned chairs encircling intimate cocktail tables and a big screen TV provide the perfect setting for sports enthusiasts. For a delicious fresh Sushi and other Japanese specialties, please order from any of the restaurants menus. The Pacifica Spa is an oasis of calm near the jungle, with an expert staff of Spa practitioners and an inspired menu of wellness services offered in five treatment rooms. Private lockers, plush bathrobes, complimentary fruit and beverages, relaxation and yoga areas [for practicing independently or joining a scheduled class], steam room, plunge pool and a Swiss shower are available. The newly remodeled on-site fitness center is located adjacent to the Pacifica Spa is equipped with an array of modern machines, free weights and matsplus a spectacular view of the rainforest. Highly experienced professional wedding planners will ensure that every detail is lovingly addressed and executed from inception to wedding day, from design concept to the menu, licenses, photographers, lodging and local transportation for you and your guests, not to mention activities and events before and after the Big Day. Explore the 12 acre resort property that takes you through lush gardens and mysterious jungle, where you are almost guaranteed to see some of the most abundant wildlife, such as white-faced and titi-monkeys, sloths, iguanas, coudamandas, and many species of birds. A ten minute hike to Biesanz beach should not be missed. At low tide you may observe turtle traps made by the Quepoa Indians who once resided on Punta Quepos. This small exotic beach has tiny waves and is great for swimming. When you are ready to discover the exotic surroundings, the resort offers many activities for different interests. and the tour desk personnel are happy to help you pick out the activities just right for you. All tours are guided by bilingual professionals and are a short distance from the resort.